No matter what software you are using it always has distinct interface. Finding two apps that are exactly same is close to impossible. Also at some point most of software has to open or save some files. And suddenly finding two apps that have different dialogs for that also becomes unexpected impossibility. Most software is using Open/Save dialog integrated in Windows. It is decent solution – it provides consistent experience between different apps, is relatively foolproof and very easy to implement (takes around one line of code to program such dialog). On other hand for same advantages there are same restrictions and Open/Save process is frozen – as good as Microsoft made it. FlashFolder adds some great features to all Open/Save dialogs across all apps that use them. I had discovered it more than year ago via freewaregenius and it became one of the most used tools for me since. FlashFolder doesn’t look like much – only address bar and few buttons that appear on top of dialogs, but those few controls pack a lot of features and add great timesaving shortcuts. Global folder history. FlashFolder remembers all the folders you had worked with lately. That history is same for all software – unlike Windows that remembers only last folder used and separately for each app. Amount of entries to remember can be set in options. Folders of open files. This one borders magic. :) It gives you folders current app is working with and all folders you have opened in explorer windows. Extra are folders you have open in Total Commander (in case you use that popular file manager). Favorite folders. Something usual for browser or file manager is great for those file-related dialogs as well. Extra again – it integrates Total Commander favorites. 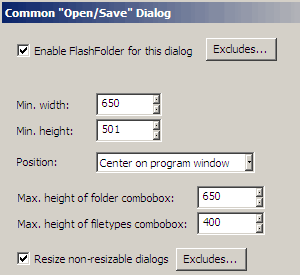 Options include few more useful things like ability to set window size and enable window resizing for non-resizable dialogs. Since FlashFolder works with low-level Windows stuff few programs play badly with it. You can easily add such to "Excludes" lists. FlashFolder is freeware and open source. Unfortunately it is not portable by design (installs as system service). It is tool aiming to be part of working environment and not on-the-go utility.